The Quantum FX R18US is a portable analog shortwave radio with a USB and SD (card) inputs. There are very few details known about this radio–indeed, no true specifications. They claim AM/FM and SW 1-7 coverage, but no frequency ranges within the seven shortwave bands. 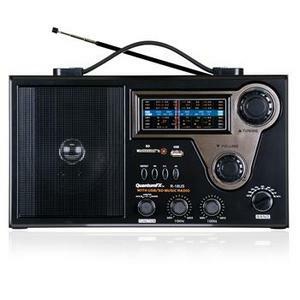 So far, this radio is only available on eBay and there are no published reviews that we can find. Please contact us if you discover one. Click here to find the Quantum R18US on eBay. This entry was posted in Portables, Quantum and tagged Portables, Quantum, Quantum FX R18US, Quantum Shortwave Radio, R18US. Bookmark the permalink.